An award-winning waterfront home designed by DesRosiers Architects and built between 2002 – 2003 by Mosher Dolan has been reduced to $4,900,000. It’s been on the market since February 2014 when it was listed for $7,500,000 and last sold in August of 2012 for $4,500,000. An article from Allen Brothers Inc. reveals the project cost approximately $4,200,000 at the time of construction. 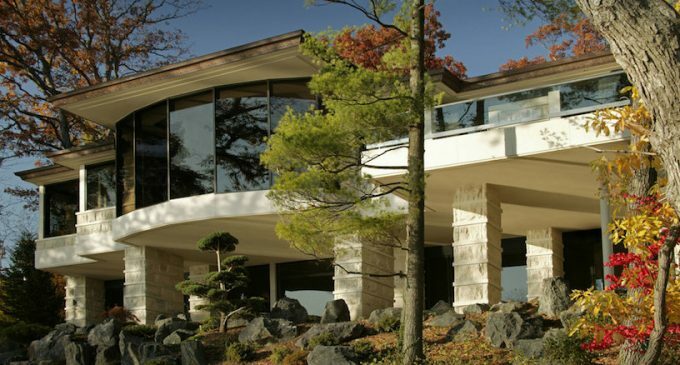 Lou DesRosiers designed the 8,200 square foot home for Mike and Kum Su Tweddle, world travellers who wanted a space to showcase their art collection. A Detroit Home article from 2005 states, “It was a joint effort that combined the visions of the homeowners, along with architect Lou DesRosiers and interior designer Susan Winton-Feinberg.” The result is a home offering exceptional quality with soaring ceilings, custom woodwork and panoramic views of Island Lake from nearly every room. The final design also won design awards in the categories of Best Foyer/Living Room, Best Master Suite, Best Dining Room, Best Building Stone and Best Fireplace. Interior designer Susan Winton-Feinberg told Detroit Home, “They wanted it to be as upper-end as possible, and in regard to built-ins, they wanted it like a 200-foot yacht,” she says. “They wanted it to be Art Deco, contemporary and Asian. Simple.” The dramatic design offers 5,000 square feet on the main level with an additional 3,000 square feet on the lower walkout level. Enjoy an open concept with massive great room opening to the chef’s kitchen and terrace beyond. There is a large library, full bar and main floor master suite. There are a total of five bedrooms and seven bathrooms throughout. Since the home is currently unfurnished, we decided to include the photos from the architect’s website. To view the full set of current listing photos click here. The home is on the market for $4,900,000 with Alexander Chapman.